Home > Heavy Duty V Belts > Poly-V Ribbed (Micro -V) Belts > J, PJ Section Poly-V (Micro V) Belts - 3/32" Rib Width. > 270J10 Poly-V Belt, Consumer Brand. Metric 10-PJ686 Motor Belt. > 270J10 Poly-V Belt. Metric Belt 10PJ686. 270J10 Poly-V Belt. Metric Belt 10-PJ686. 270J10 Poly-V Belt. 27" (686mm) Length, 10 Ribs (1" Wide). Metric Belt 10-PJ686. High Performance BANDO Industrial Grade belt. Replacement Vicmarc VL300BM/VL300L-ASM/VL300S-ASM Lathe belt. (10) J Ribs x 690mm Length. Vicmarc P00091 belt. 270J10 Poly-V Belt, Consumer Brand. Metric 10-PJ686 Motor Belt. 270J10 Poly-V Belt, Consumer Brand. 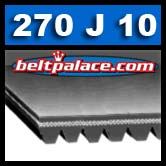 27� Length, PJ686/270J 10-Rib Drive Belt replaces fitness belts, compressor belts, drive belts, and electric motor belts. 270J-10 Micro-V Belt. 270J8 BANDO Industrial Grade Poly-V Belt. 27� Length x 8 Rib PJ686/270J Belt replaces fitness belts, compressor belts, drive belts, and electric motor belts. 270J8 Micro-V Belt.